The story of West Center Street is one of those simple things that quite often gets completely overlooked in the history of the Magic Kingdom. While it's disappearance wasn't all that long ago, there's very little record of the street itself, and little to no reference to it within the Magic Kingdom today. In 1971 when the Magic Kingdom first opened to the public Main Street U.S.A. looked quite similar, but also vastly different due to two major changes. If you walk down Main Street today, you'll notice something a little odd. When you get to the heart of the walkway (about halfway down), you'll notice a small alleyway type street that leads off to the right hand side. While that street still has a name, East Center Street, it begs the question, "What happened to West Center Street?" Oddly enough, in many ways it's still there, but in other ways it has completely gone away. So, if you're standing on Main Street and look West (to your left) you'll notice a section of the Emporium that sits back away from the rest of the storefronts. Technically, this is what's left of West Center Street. 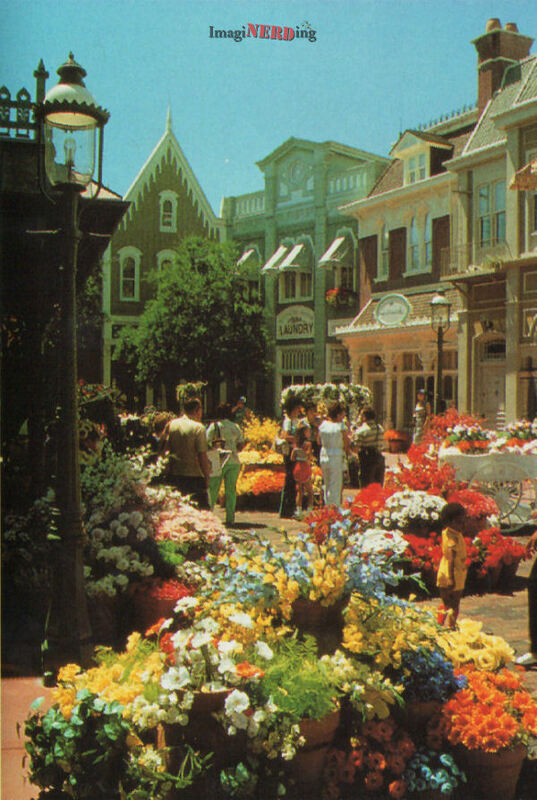 In 2001 Disney decided to utilize the space that was once a street to fill in the Emporium so that it encompassed the entire left hand side of Main Street. While, from a business perspective, this was a quite understandable and smart decision, many things were lost as a result of "filling the gap" of the Emporium. Also, when that change was made, the street lost a bit of that small town U.S.A. feel that it once possessed through a variety of shops that were not connected. It was truly a "small town" experience that seemed to simply defy time and modern day advances. As with everything Disney does, they developed a story to explain the expansion from the store owner's perspective. According to Disney lore, the shop owner continued to make advances to his store, including everything from gas lights, to more modern styling, but his greatest representation of the store's success was an expansion that increased the size of his creation. Honestly, it's a clever story, but it's hard not to wish what was left behind will someday return (despite knowing that will probably never happen). Before the expansion, West Center Street featured an array of unique stores including: The Greenhouse Flower Shop, The New Century Clock Shop, the Hallmark Card Shop, and the Harmony Barber Shop (which was later relocated). The other locations, the Hallmark Card Shop and New Century Clock Shop, both are very difficult to find information about and even more difficult to find images of. However, as you would expect, the Hallmark store sold specialty items, gift wrap, and greeting cards. The New Century Clock Shop also sold exactly what you would expect, clocks. Again, while these are simple stores, it's truly amazing how much one expansion influenced in a very short amount of time. When these stores disappeared and the expansion was built, the story of these unique stores ultimately fell away over time. Today, it's even hard to imagine the left side of main street as anything more than the Emporium as it has stood for quite some time. Don't get me wrong, the Emporium is one of the best stores for Disney merchandise on Disney property, but it's hard not to miss the unique gifts that could be purchased and brought home with you in the "lost" days of Disney. At that point in time, a souvenir from Walt Disney World was more than a t-shirt or a souvenir mug, but rather something that would bring to mind a specific place and a specific memory that place created for you at one particular moment. Today, Disney tends to be a world of repeating souvenirs that are, for the most part, not specific to the location. Just as before, it's a smart marketing and business decision, but it's truly amazing how some things have changed and how some elements of "unique" souvenirs are returning slowly. When comes right down to it, just like I said in our last post in the series ("Departed Disney": A Look Back at the Town Square Cafe ), Disney has always been a place that accepted change and developed as the world developed around it. Unfortunately, nostalgia doesn't keep a theme park continuously popular, but I do believe that these elements of "Departed Disney" should be shared so that we can appreciate the ideas and concepts that have developed the "World of Disney Parks" into what they have become today! Enjoy this article? SHARE it with friends! Thanks!